Ok dudes, good ol’ real life is interfering with the normally ruthlessly efficient comic production machines here at Blob Towers again. Until I can get them up and running and chucking out minty-fresh epsiodes of the world’s greatest webcomic once more, please enjoy this special courtesy episode of RSI* at no extra charge. *Sneak preview of an RSI mini-comic I’m putting together! 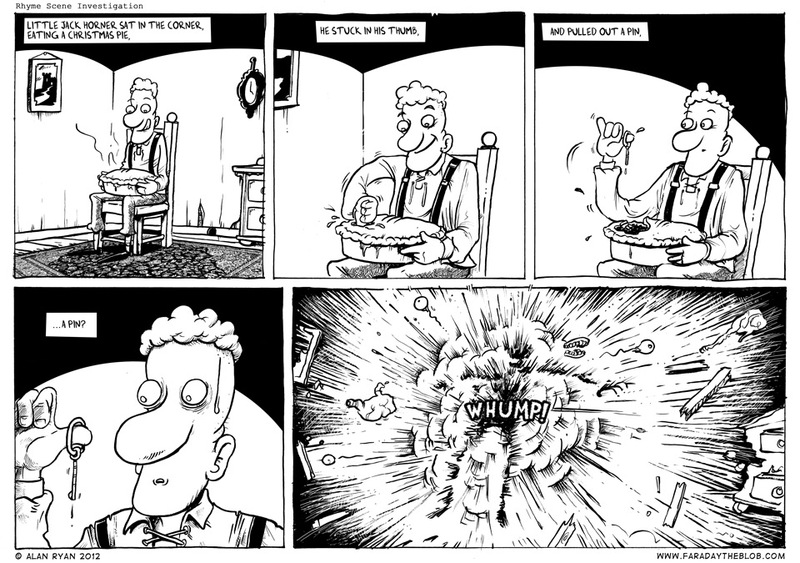 This entry was posted on Monday, May 28th, 2012 at 12:01 am and is filed under Comics. You can follow any responses to this entry through the RSS 2.0 feed. You can skip to the end and leave a response. Pinging is currently not allowed. That dude was totally asking for it. Love the explosion you got going on in there. Cheers Saeed. Ridiculous explosions were probably one of the things that got me wanting to draw comics in the first place! Hilariously well done. Now I want you to redo more childhood rhymes. What a good boy he was! Justin - I have a stack of these nursery rhyme comics I’m gonna put together into a mini-comic, I think. I’m gonna put up a site for my other non-Faraday comics before too long as well, so you’ll probably see them there too! Complete non sequitur: One of Genesis early albums was called Nursery Cryme. Ha – must give it a listen so. That was actually one of the names I had floating around for this series, but I didn’t use it cos it sounds a bit, erm, creepy. Clearly not a problem for Peter Gabriel though! Still making me laugh even in black and white! And I love that close up in panel four. Poor Little Jack! Love the teeth ‘sploding out. You got a real audible LOL from me.